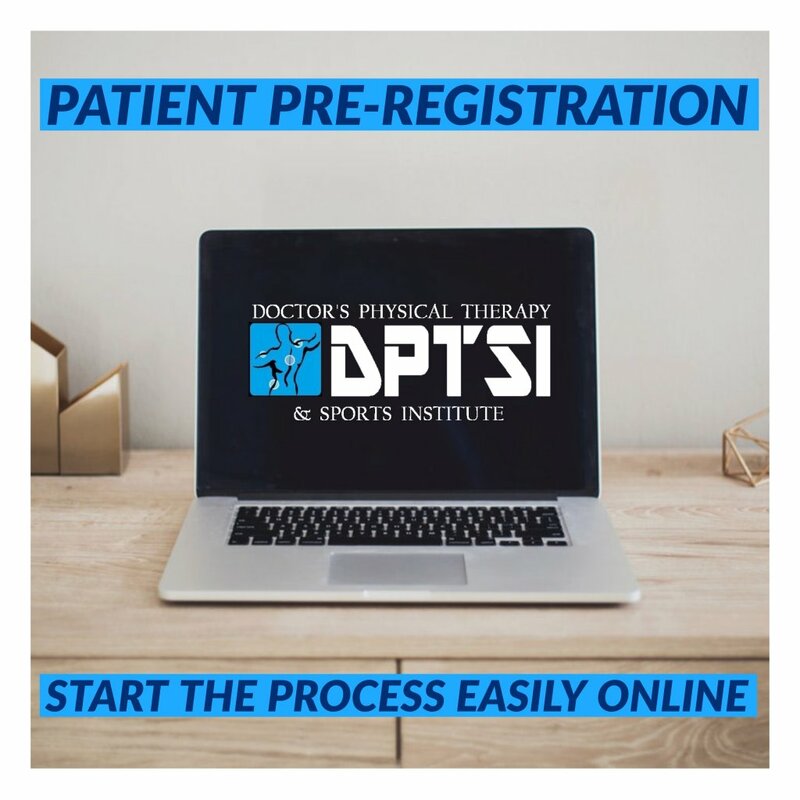 DPTSI is proud to provide our athletes with the HydroWorx integrated underwater treadmill which is revolutionizing physical therapy, sports medicine and conditioning. 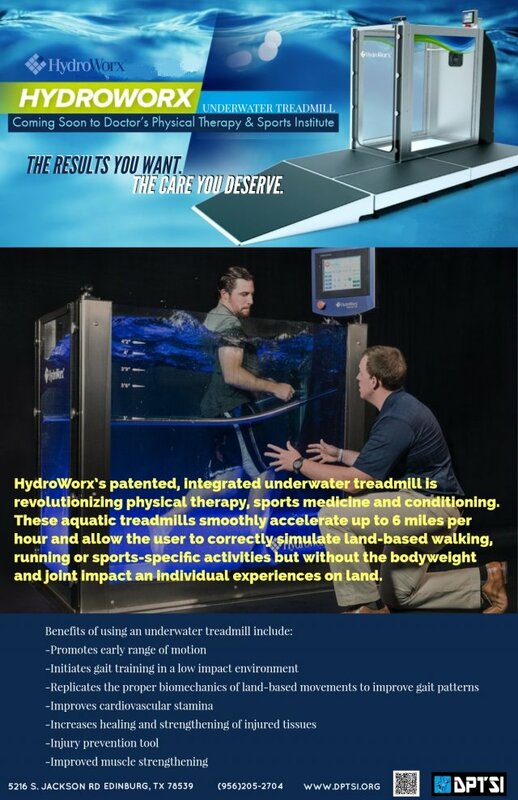 These aquatic treadmills smoothly accelerate from .1 up to 10 miles per hour and allow the user to correctly simulate land-based walking, running or sports-specific activities but without the bodyweight and joint impact an individual experiences on land. HydroWorx offers deep tissue massage by a hand-held hose water jet. In overworked muscles, at the cellular level, it is important to break down the toxic buildup so that oxygen rich blood can bind to the cell and rejuvenate quicker. Sore muscle will recover faster from Delayed Onset Muscle Soreness (DOMS) for your body to return to homeostasis. In the United States, those who can perform aquatic therapy are legally regulated medical professionals with the correct scope of practice and the ability to use the American Medical Association (AMA) Current Procedural Terminology (CPT) codes. Aquatic therapy is considered an add-on certification for physical therapists and athletic trainers who often work closely with occupational therapists and exercise physiologists to develop a plan of care for each client. Aquatic therapy is different from aquatic exercise or aquatic fitness because it is a physical medicine and rehabilitation specialty that requires the involvement of a trained professional and is covered by many insurance providers due to the personalized nature of the treatment. • Warm water provides a relaxing and soothing environment for aching joints and muscles. • Water’s natural viscosity can be used for muscle strengthening and increasing rehabilitation progressions. • Buoyancy allows for flotation and reduces the effects of gravity on injured or aching joints and muscles. • Allowing people with balance deficits to perform exercises without a fear of falling and decreasing pain. • Turbulence and wave propagation let the therapist gently manipulate the client through the desired exercises. • The respiratory muscles are forced to work harder in the water, allowing for a natural strengthening. Compared to other forms of physical therapy, aquatic therapy results in a higher client compliance rate and less pain throughout the recovery process. 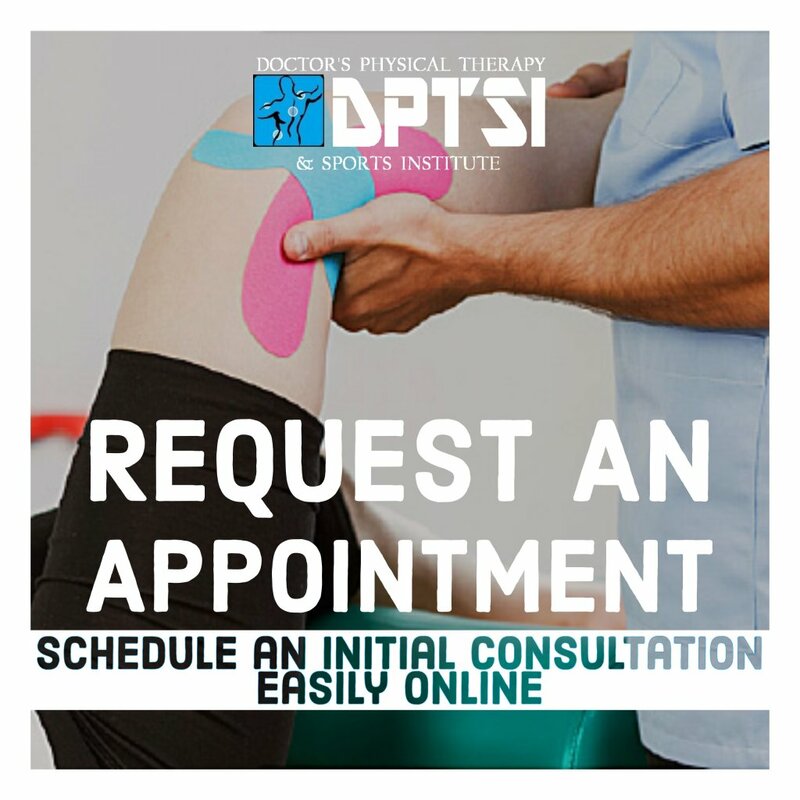 Opportunities to significantly minimize the pain a client experiences should be taken seriously because with less pain, a client can enjoy a higher quality of life. Another important advantage of aquatic therapy is that it can often begin before land-based therapy. For athletes looking to get back into competition, or busy professionals who want to recover from surgery as quickly as possible, this makes a water-based program the natural choice. DPTSI offers pain relief and wellness services with the HydroWorx Underwater Treadmill. 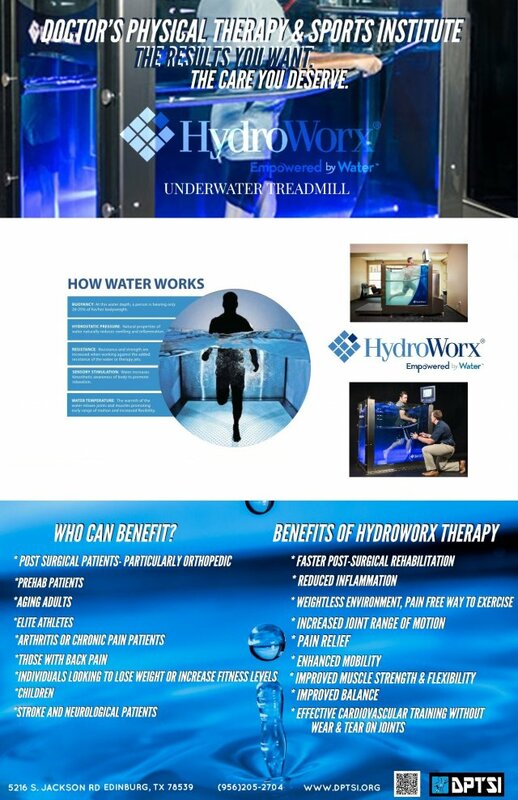 HydroWorx is an underwater treadmill that can be used for a massage and a workout. Hydroworx demonstration of how underwater treadmill can be used for gait training, therapeutic exercises and multidirectional activities with seniors. Water based fitness is a growing activity for all of us as we age. Water brings less pain and healthy gain to your residents.